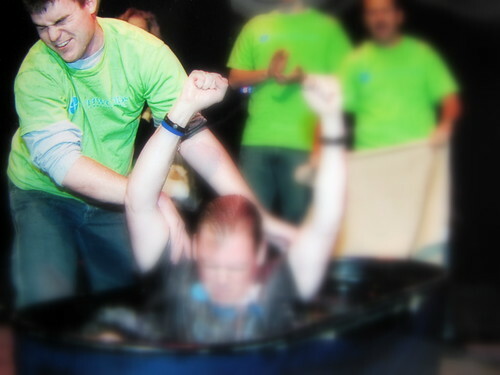 A few weeks ago we had a big baptism service at Northwoods. Since I am on the pastoral staff team I get to be part of the team that does the baptisms (in the lake in the summer, or this time THANKFULY inside!) During our weekend services, over 115 people were baptized, it was a really cool weekend. I baptized several people in each of the services but one individual was most ‘memorable’. This particularly ‘memorable’ baptism made me think back to my practical ministry class in college where we all went to the pool and practiced dunking each of our classmates so we would know how to baptize people without falling over or leaving the person under the water etc. But one thing they didn’t teach usin that class was to watch out for wild flying punches. One of the guys I was baptizing who will remain nameless (to protect the not so innocent) was so excited when he came out of the water he jumped up with both fists in the air. Well both fists were in the air AFTER one made contact squarely on my left eye. After seeing a few stars, turned my back to the crowd not knowing what my face looked like and assured my wet friend everything was ok. I was just happy I didn’t fall over knocked out cold. I spent the next few hours wondering if I would wake up on Monday with a black eye as a Baptism weekend souvenir. Luckily I didn’t have such a souvenir. During the baptism services photographers were snapping shots to catch the exciting moments for each of those being baptized and they caught this action shot. The Spring 2010 Church IT RoundTable is just a month away. If you haven’t registered go on over to www.citrt.org and claim your seat, QUICKLY! One of the great aspects of the CITRT National events is to learn about great products and services that you might need to implement or use in the coming year. We will be again having the Vendor Bazaar were CITRT partners can share, demo, explain etc the technology and tools they sell. Maybe there is already one of those “would it be possible…” projects on your list and you don’t know of a vendor with the solution, shoot an email to info@citrt.org with your need and we’ll see if we can find a vendor to meet with you face to face at the Roundtable. Maybe you know of a vendor that others should meet and learn what they have to offer, if you have a vendor in mind contact them and encourage them to check out the CITRT Spring RoundTable Sponsors Page or email info@citrt.org for more information. One of those can’t miss opportunities for Church IT people is about to take place just a few weeks away. The Church IT Roundtable’s National Spring event will be hosted at Saddleback Church (Lake Forest, CA) March 11-12. If you have attended a CITRT event in the past, you know what I am talking about. If you haven’t attended I am serious when I say its a highlight of my year. Every time I go to a CITRT event I learn tons about Church Information Technology, I meet awesome peers and I have a great time. If you are in Church IT (staff, volunteer, vendor) you can’t afford not to attend this event. Since today was a snow day, I thought I would break the silence here on the blog. 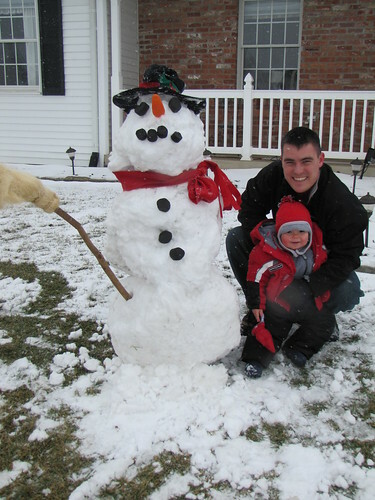 Well not exactly a snow day with no work or school… but Jonathan’s first day to play in the snow. Over the past few weeks Natalie has insisted to find a great buy and purchase snow pants for Jonathan incase of a big snow… Well she found the deal, and I hope Jonathan likes the pants because they are big enough for about 3 winters! We found the deal just in time for an ‘amazing’ snow fall of 1.5 inches which warranted a snow day. 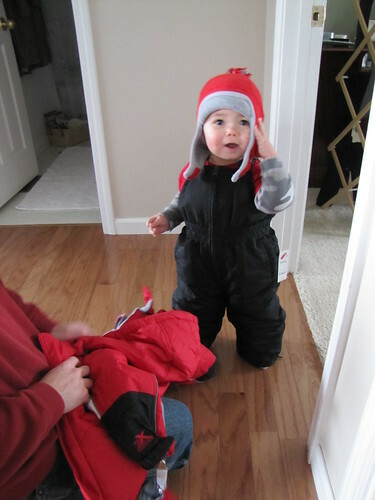 So Today after we finished lunch we all go our warm gear on (some more gear than others) and headed out to the snow. Of course when you are out in your first snow adventure, you have to learn you can eat snow as long as it’s not yellow snow (or brown, thanks Toby). Since the snow was really wet we decided to make a Snow Man… as soon as I started rolling the snow we could hear “Ba, Ba Ba” (Jonathan’s word for Ball). 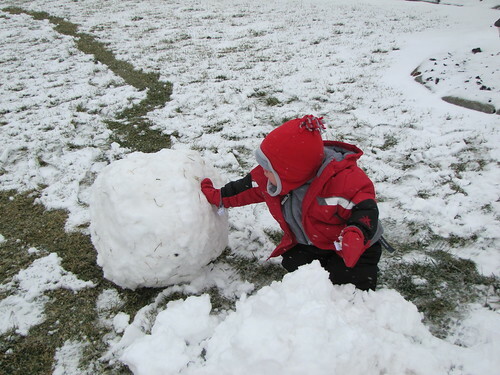 The bigger the snow ball, the faster and LOUDER we heard “Ba, Ba, Ba”. Soon he was yelling “BA”. After rolling snow, we had our finished project and it was time for Dad to head back to the office, I think Jonathan enjoyed our lunch time adventure. In the process of migrating our servers from 2003 to 2008 and 2008 R2 we have started migrating our print server. When you bring online the print server we downloaded the 32bit and 64bit drivers for each printer. While most of our systems are still 32bit the new print server is a 64bit server, hence needing both drivers. Installing the 64bit drivers was fairly straight forward but allowing 32bit machines to print via this server you also have to add the 32bit drivers as well. In the past this has been the reverse but the process is the same.. Add and Share the printer then go back in to the Printer Properties and on the Sharing tab add the driver for the other, in our case adding the 32bit drivers for the guests. When adding the 32bit drivers we ran into some issues. Since a lot more printer drivers are shipping with windows in 2008 Server the wizard that adds the printer wants to install the OEM driver. Which we found would print just fine from the server but give us one of two errors when we tried to add the 32bit driver. This error is a result from attempting to install a 32bit driver that doesn’t match the 64bit driver that the printer is currently using. This is most likely caused by installing the printer with the OEM driver for that printer that came from windows update or shipped with Windows Server. This is an issue because the Printer name in the OEM.inf and the .inf file provided by the vendor for the 32bit driver is somehow formatted differently … ie: ‘PCL_6’ might be ‘PCL6’ or some other slight variation in the printer name in the .inf file. 1. 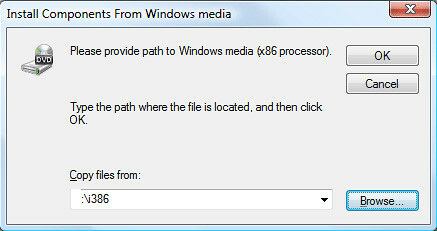 Find the oemsetup.inf file and edit the printer name or change the 64bit driver that the printer is using. 2. The easier of the solutions is to change the 64bit driver from the OEM driver to a downloaded 64bit driver supplied from the vendor. Once you change the driver or add the manufacture’s driver the install of the x86 driver will not be an issue. This occurs when the driver doesn’t match the formatting in the 64bit driver as above, but the issue isn’t resolved when using a vendor supplied 64bit driver. You can attempt to find the differences between the two vendor supplied drivers as mentioned in issue 1 or take the following steps to install the 32bit driver. 9. The driver will be installed from the included drivers on the 32bit OS or it will prompt you for the location of the driver. 8.Once the driver is installed you can check the server and the X86 box will be enabled. One of our recent projects has been preparing for and testing of the migration of our ACS Server. We are are working to migrate our ACS Terminal Server from a 2003 Terminal server to a 2008r2 Remote Desktop Server and one of the problems that has caused frustration is the Remote Desktop Server CALs (Client Access Licenses). We have software assurance so having those CALs wasn’t the issue, SA migrated our 2003 TS CALs to 2008r2 Remote Desktop CALs… The problems started when we brought the new server online and added the Remote Desktop Role it wouldn’t sync up with the license server. “Prior to Windows Server 2008 R2, the license server was automatically discovered on the network. This discovery is no longer supported for an RD Session Host server that is running Windows Server 2008 R2. But nowhere in the document does it say how do setup said configuration… Other than you can do so by going to the Remote Desktop Session Host Configuration window. In the RDSHC window (my abbreviation not Microsoft’s) you can see what license issues you have, and in our case we didn’t have an active license server but we couldn’t figure out how to fix that. Finally today I came across this article [here] which links to this article [here] that actually gives the step by step instructions. The gotcha is in the RDSHC window you need to not right click on any of the tree headings but select the top level and then go into the window and right click on the RD license server text for the properties menu to display. Incase the links go dark here are the step-by-step copied from the TechNet page. In the Add License Server dialog box, select a license server from the list of known license servers, and then click Add. If the license server that you want to add is not listed, in the License server name or IP address box, type the name or IP address of the license server that you want to add, and then click Add. You can add more than one license server for the RD Session Host server to use. The RD Session Host server will contact the license servers in the order in which they appear in the Specified license servers box. You can also specify a license server for the RD Session Host server to use by applying the Use the specified Remote Desktop license servers Group Policy setting. 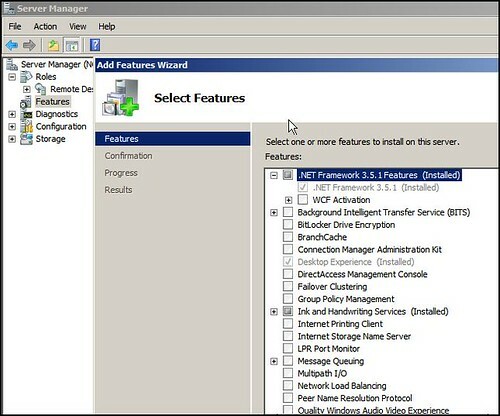 This Group Policy setting is located in Computer ConfigurationPoliciesAdministrative TemplatesWindows ComponentsRemote Desktop ServicesRemote Desktop Session HostLicensing and can be configured by using either the Local Group Policy Editor or the Group Policy Management Console (GPMC). Note that the Group Policy setting will take precedence over the license servers configured in Remote Desktop Session Host Configuration. Now.. I have to say I am not complaining that the new navigation is bad.. just the new way things are being displayed in 2008 and 2008r2 one has to get accustomed to… BUT i am complaining that its a little frustrating when you search the net for ‘how to configure type articles’ and you have go to three or four layers deep to find the instructions. So… i hope this helps you in you quest to configure the Remote Desktop license server… as well as provides me a place to look when I forget next time I bring online a new server. As I have discussed in previous posts  ,  and  we would love for synchronization or sharing of data between our ChMS and Planning Center Online. My recent push has been to get the sync to work for ACS and PCO, obviously because that would impact us most because we use ACS. In our conversations with PCO Owner Jeff Berg we found out that PCO had plans to synchronize with multiple ChMS products not just ACS, which was great. In that conversation multiple staff from ACS talked thru how to make the APIs work and for PCO to integrate. It looked like we finally had progress to an integrated solution not just for ACS but all Church Management systems. Then turn the page a couple months later, and this week I was disappointed to receive the email below, which I totally can understand but disappointed none the less. We have had a long discussion this morning about integration and the difficulties in what we were trying to accomplish. We have found this too large of a task for us to accomplish. This is not just with ACS but with all of the other ChMSs we were talking to. We have spent over a year and a lot of cash doing this and just haven’t found a reliable way to integrate with all of the ChMS systems out there. Every time we thought we were clear we would run into a hurdle with an API or data consistency issue. I’m really sorry for this, I was very excited for this project but it just didn’t work. So if you who have asked about such a tool, I encourage you to contact your ChMS and see if there is a way to make this project work. If you are an ACS customer contact Sally Grantham and let her know your needs and interests. I will stay to the PCO crew, thanks for the effort, and I still hope that we can see this product work.